[prMac.com] New York, NY - To celebrate the inauguration of the 44th President, beamME is giving away a vacation just for doing something that comes naturally: meeting new people. Beginning today and running through January 24th, every new personal or business contact made using free app beamME for iPhone/iPod Touch provides an entry into the beamME/Up Sweepstakes. Bonus entries are also available for completing fun challenges, like beaming people named Michelle or the President-Elect himself. One lucky winner and a guest will fly away anywhere in the US. "This week tens of millions of Americans will celebrate the inauguration by joining together at events across the country," said Gabe Zichermann, CEO of rmbrME, the developer of beamME. "Whether you're on The Mall or celebrating at home, beamME makes socializing more meaningful - and rewarding - than ever before." beamME is the world's most popular service for mobile contact exchange, enabling any mobile to "beam" a socially-networked vCard to any other device, without handset or carrier restriction. Card recipients need no special hardware, software or registration to retrieve their new contact and - in most cases - can add directly to their phone or PC address book with a single click. 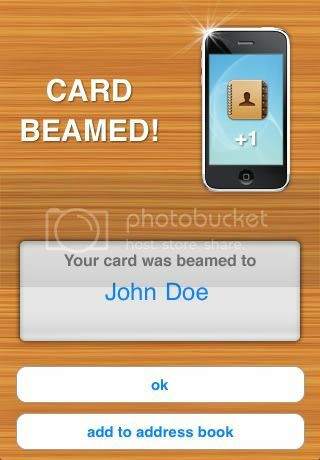 beamME is available as a free download for the iPhone or iPod Touch from the iTunes App Store. US residents can enter the beamME/Up sweepstakes just by downloading and installing the free beamME application for their iPhone or iPod Touch. Every time they meet someone new during inauguration week and use beamME to exchange their contact information, they receive an entry. Bonus challenges, detailed on the beamME website, offer an opportunity to increase the number of potential contest entries. The complete set of sweepstakes rules and restrictions can be found online. Based in New York City, rmbrME is best known for developing the breathtakingly powerful, simple and popular Mobile Contact Exchange application beamME for the iPhone/iPod Touch and SMS. rmbrME's core philosophy is that digital contact exchange only works when it is device, carrier and social network independent, lifting the requirement for recipients to have special hardware, software or registration before being able to access new contacts.